Over Christmas break I had the lovely opportunity to attend an annual Civil War ball held by one of the Civil War groups that I was a part of in High School. It was so nice to see many old friends and meet some new ones, too. I also had the opportunity to introduce my brother, his girlfriend, and her friend to Civil War reenacting and get them dressed in period attire. Pictures of our dresses and the evening to follow soon! I wore a green silk ballgown that I had made several years ago. 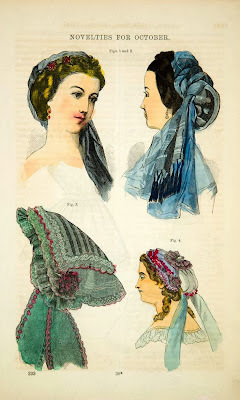 The gown was designed around the green and white sheer silk head scarf, seen in the above headdress, that I purchased in the hopes of making a headdress similar to the turban-style headdress that I had seen in a period fashion plate. At the time, I was interested in things from the 'orient' and how they influenced fashions of the era. 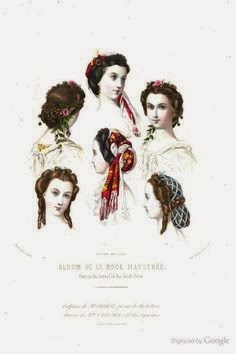 Below are two fashion plates from the 1860s illustrating the 'Almira' headdress. Using millinery wire I formed two ovals and connected them at the center back. I then wrapped the wires with the silk scarves and wide purple silk ribbon. The fabrics were then sewn in place. I love the headdress and what I can see of the dress! I have a book about the Eastern influence on the Victorian era that I have to read sometime, but I have so many things to read first! I wish we had had Colonial re-enactment groups when I was in school!